If there’s one thing you can give Marvel credit for, it’s consistency. This is now the 18th film in their Cinematic Universe, spanning back to 2008’s release of the very first Iron-Man movie. We’ve come a long way, haven’t we? The great part of what Marvel is doing now has to do with that exact consistency. They’ve built up such a fan base where they have begun to take risks in their film-making, knowing full well that whatever they release will break box office records and do a billion dollars worldwide. They’ve built up such a good rapport with audiences that they can turn the keys over to a rising-star of a director like Ryan Coogler and have him make a superhero movie that feels a lot different than anything we’ve gotten before. I’m not sure how I’d rank this with some of my other favorite Marvel movies (Iron-Man, Iron-Man 3, The Avengers, Avengers: Age of Ultron, Guardians of the Galaxy, Spider-Man: Homecoming), but it’s definitely close to the Top 5 if not inside it. The movie focuses on the fictional country of Wakanda (ask Trump about our relations with them), a technological sanctuary with some of the most advanced medicinal advancements and weaponized tech in the entire world, largely because of their country being geographically located on top of a ton of Vibranium (the rare metal which comprises Cap. America’s shield. No, I don’t think it’s the same thing Wolverine’s claws are made of, I think that’s man-made and Vibranium is found in nature). Anyways, an internal debate rips through the nation. Many of the older members of the government want to keep the country as isolationist, afraid that doing too much outreach to an impoverished Africa could bring immigration and the associated problems with it. Others want Wakanda to take charge of the world, and ensure that everyone on the planet has access to the great things they do. Sound a little bit familiar? I would suggest watching Captain America: Civil War before this movie because the opening portion of the film largely deals with where we left T’Challa/Black Panther (Chadwick Boseman) at the end of that film. His father was assassinated by a German terrorist in that movie, and he is on his way back to his home country to inherit the crown. His loyal bodyguard (Danai Gurira from “The Walking Dead”) accompanies him, and he stops in a neighboring nation to catch-up with an ex-flame who he obviously wants to convince to inherit the position of Queen, named Nakia (Lupita Nyong’o from 12 Years a Slave and Queen of Katwe). After a ceremony, T’Challa is crowned King, but the loss of his father stays with him, as he deals with his grieving mother (Angela Bassett) and catches up with his tech mogul younger sister Shuri (Letitia Wright). However, a secret threatens to tear them apart concerning the death of T’Challa’s Uncle (who’s also the dead King’s brother). The past comes back to haunt them as Vibranium thief and international terrorist Ulysses Klaue (Andy Serkis) makes an appearance with a new apprentice named Erik Killmonger (Michael B. Jordan). Now, the coolest thing about the film is not the visuals or the action or even the political consequences, but rather the fact that the movie feels like it’s welcoming in new cultural motifs into the superhero genre. We’ve had African-American heroes before like Falcon or Rhodes in these movies or Cyborg, or Blade previously, but this movie gives us a country in Africa with its own culture. It also takes place largely in Oakland, where the director Ryan Coogler grew up. All of the scene transitions with the soundtrack are largely hip-hop influenced with Kendrick Lamar lending a few songs to the cause. This is modern superhero film with modern implications and modern culture, and it doesn’t feel as wimpy or outdated as a Captain America or Superman figure. They both have decent movies in their own right (in fact, 1978’s Superman starring Christopher Reeve, directed by Richard Donner is amazing), but it was really refreshing to have a movie which recognized that everyone deserves a hero that they can warp into. Wonder Woman helped us with that, and I think this one does too. I’m not trying to convince anyone that white-male superheroes are outdated, but let’s share the wealth a little bit, people. The Star Wars franchise gets it, and now Marvel does too. The Killmonger character is such a great addition to the pantheon of Marvel villains for a few reasons that are connected to plot-related spoilers, but just know that his motivations are so pure that I ended up switching my allegiance between him and T’Challa pretty frequently. He’s a wholesome character, and I’ve often said that a superhero film is built or broken by its villain. As one point of criticism, I would’ve liked a little bit of additional character development for T’Challa’s family, girlfriend, and loyal supporters. There are a lot of familiar faces from other properties but I tended to identify them as “oh that’s Michonne from The Walking Dead” or “hey, that’s the guy from Get Out,” rather than actually have opinions about their characters. Even T’Challa himself is a bit bland, and they whittle away at Chadwick Boseman’s impeccable charisma. Even though every character isn’t wonderfully fleshed out, the movie does such a good job at allowing the director Ryan Coogler keep his vision. Coogler directed that fantastic Rocky reboot Creed and also made the timely police violence movie Fruitvale Station. He goes back to his roots by including scenes shot in his home town of Oakland, and in addition to this movie being modern and inclusive with its characters and hip-hop influenced score, this movie marks the start of Marvel giving directors more freedom in their films. The voice of the director remained through the corporate process. The one main creative criticism I’ve had with Marvel is that their films often feel cookie cutter and derivative. Here, we get a Ryan Coogler movie, dressed up through modern politics, inclusive story-telling, and a really good central plot. A Fantastic Woman or “Una Mujer Fantastica” is the Chilean nominee for Best Foreign Language Film at this year’s Oscars. Now, I don’t pretend to say that I watch a ton of foreign films, largely because they don’t really open in New Jersey theaters, but I wanted to be sure to catch this. I wanted to review this partially because it’s a front-runner for the aforementioned Oscar, but also because of the social implications it could have. Because the movie takes place in Chile, we see a legal and social system that feels so much different than our own. It made the movie occasionally almost tough to relate to. The movie centers on Marina (Daniela Vega) a transwoman living with her much-older boyfriend Orlando. Orlando is divorced and has some estranged family, while Marina seems pretty alone after her transition, and is a singer at nights/waitress by day. When Orlando suffers a heart attack and dies prematurely, Marina sees herself subject to a prejudiced family refusing to allow her the chance to grieve and be a part of the funeral proceedings. Absent is a will or any piece of probate court in determining what Orlando has left for Marina, even though it was obvious they’d been together for some time. While the prejudice directed at Marina seems a little harsher than what she would deal with in America, the transphobia of his estranged family is equal parts sad and infuriating. The movie does a nice job with leading us down dead-end plot lines. It never ends or evolves in the way you’d expect. It feels like a very real snapshot of this person’s life. I’ve never seen any of this director’s other work, but the movie has its own visual palette of colors that often felt refreshing and added to the mood being affected here. Partially, it’s simple as a normal person dealing with grief the way anyone else would, but it also deals with social stigma of being trans. The film manages to tell these equal components of the story pretty effectively. My issues with the movie are partially due to the fact that I can’t really relate to the almost barbaric style of handling the dead’s affairs. I’d be willing to overlook this if I felt that his estranged family was anything but caricatures. They serve a purpose for the plot, but we get a movie where there’s only one character, and it isn’t that interesting to watch her grieve with no other characters around. Overall, although I liked the visual style and social purpose, I often felt underwhelmed by the drama. I’ll settle in the low 7 range. Netflix original films have plenty of dramatic projects that are worth your time, but they also have a knack for getting pretty reputable comedic actors into their original comedy features. Last week, they released When We First Met, a film about employing the supernatural to try to get out of the friendzone. 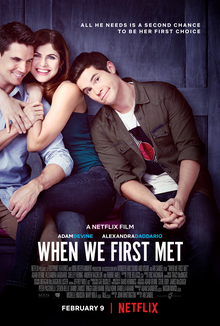 Adam Devine is Noah, the single best-friend of recently engaged Avery (Alexandra Daddario). Avery is happy as could be, but Noah desperately has craved her romantic interest for years since they met at a Halloween party, which started their intense friendship. Noah gets drunk, melts down in front of Avery’s other female best friend Carrie (Shelley Hennig), and ends up in an old-school picture booth which transports him back to the day they met. Intent on getting her to fall in love with him, Noah tries again and again to alter the future, with no regard for what’s right for Avery. I’m a big fan of Adam Devine, especially in Mike and Dave Need Wedding Dates, one of my favorite pure comedies of recent memory. I also think Alexandra Daddario is better than advertised, being the best part of both Texas Chainsaw 3D and Baywatch, and also being a nice bit part in “True Detective.” They have nice chemistry here, and I like the way the plot unfolds. The problem is that this movie is a bit too long, and the main characters figure out the truth about three scenes after the audience already has. It’s decently funny, occasionally charming, and I like the plot, but the pace just drags in spots and it never quite reaches the emotional or comedic depths it wants. It could’ve been a crazier, zanier comedy, and it could’ve been more emotionally affecting. Instead, we get something in between, and I wouldn’t recommend it as a comedy or as a late-night romance film either.